This post originally appeared on my site Chocolate Noise! Well, we did it! We crossed over into 2017, aka what's going to be a banner year for bean-to-bar chocolate. The forces are aligned; I can feel it. I'm super pumped that my book about American craft chocolate comes out in August! Storey Publishing, my publisher, has been collecting quite an assortment of bars from every maker you can imagine to photograph for the book, but they haven't eaten a single one. Nope, they've been patient, and later this week I'm going to spend the day with them, leading several chocolate-tasting sessions. 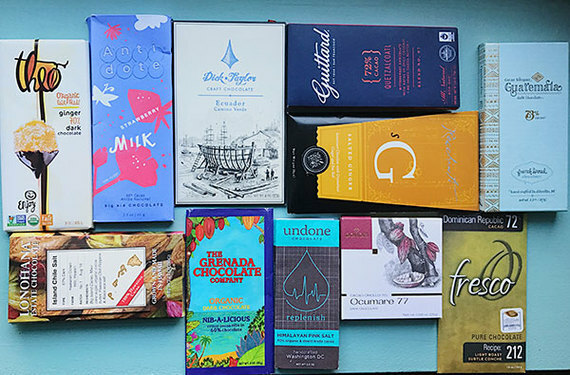 If you had to pick five bars to represent the American bean-to-bar movement, which would you pick? I have a rotating assortment, but I want to hear from you. I'm also going to see the designed pages for the first time! I saw a sneak preview a few months ago and loved the playfulness of it, but this is going to be the real deal. I can't wait to share it with y'all in August! Tell me your five bars at megan@chocolatenoise.com or on Facebook, Instagram, or Twitter and I'll publish your comments in the next Chocolate Today!